HAIFA, Israel --- Elbit Systems Unmanned Surface Vessel (USV), the Seagull, participated in a joint Anti-Submarine Warfare (ASW) exercise of the Israeli and the French navies held recently in the Mediterranean. 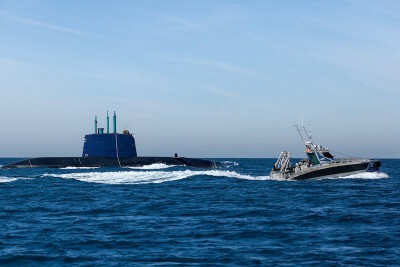 Under the Israeli Navy command, an ASW force that included two Israeli ASW vessels, a frigate and an ASW helicopter of the Marine National and the Seagull, performed ASW missions against an Israeli Navy submarine. The joint force has simultaneously operated manned and unmanned surface and airborne vessels, practicing advanced means and tactics for submarine detection and deterrence. In addition to ASW capabilities, the Seagull features switchable, modular mission payload suites and can perform Mines Counter Measures (MCM) missions, Electronic Warfare (EW), Maritime Security (MS), Hydrography and other missions using the same vessel, mission control system and data links. Seagull offers navies a true force multiplier delivering enhanced performance to naval operations, reducing risk to human life and dramatically cutting procurement and operating costs.